Update: Barry Larkin elected to Cooperstown by the Writers. Morris receives sixty-one more votes than Bagwell. As part of our obligations for membership in the Baseball Bloggers Alliance, we must submit a vote on each year's Hall of Fame Ballot. Of course, even if we weren't obligated, we would anyway, because this is fun. Sturgeon General and yours truly each picked six players eligible for induction in 2012. Five of our selections overlapped, leaving a total of seven (out of a possible ten) votes. These were the votes we submitted to the BBA. In the final BBA voting, only two players--Jeff Bagwell and Barry Larkin--surpassed the 75% threshold, making them the official BBA nominees of 2012. Below, we present our votes, alongside the BBA tallies, with explanations after the jump. Also on the ballot: Dale Murphy, Javy Lopez, Brad Radke, Tim Salmon, Bill Mueller, Phil Nevin, Tony Womack, Jeromy Burnitz, Brian Jordan, Eric Young, Ruben Sierra and Vinny Castilla. Pros: Twelve-time All Star. Posted an exceptional 51.7 wins above replacement (rWAR) during his best ten-year stretch (1990-99). Cons: If you can think of any, feel free to share in the comments. J-Doug says: His best ten-year stretch leaves no doubt that he deserves this. Sturgeon General says: Larkin was almost uniformly recognized as the NL's best shortstop throughout the late 1980s and 1990s. As a counterpart of Cal Ripken, he actually compares favorably to the Iron Man when it comes to rate stats. Pros: Four-time All Star. Slugged 449 dingers over fifteen seasons. Dominated the strike-shortened 1994 season with an OPS+ of 213, amassing 300 total bases and winning the MVP. Posted a sizeable 79.9 rWAR over his career, including 65.7 rWAR during his best ten-year stretch (1992-2001). Cons: Had misfortune to slug in an era when hard-hitting 1Bs came under suspicion for PED use. J-Doug says: The numbers speak for themselves on this one. He's an all-timer, patently deserving on enshrinement in Cooperstown. Sturgeon General Says: Has unfairly been lumped in with steroid users. There is no evidence or accusations as of today that he ever used PEDs. He had a normal career arc and was a for a first baseman was surprisingly fleet of foot. Pros: Probably the best DH ever. Posted a staggering 50.5 rWAR during his best 10-year stretch (1991-2000). Career OBA of 0.418 is #22 all-time. Cons: Played DH almost exclusively. J-Doug says: I'm the kind of guy who thinks a player is Hall worthy if he was the best at his position, regardless of how valuable that position is. 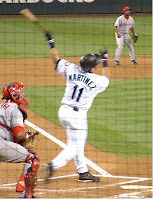 Edgar Martinez is that player, but he also deserves it on his own merits. Sturgeon General says: Edgar's HOF perspectives are coming from the worst of both worlds. Voters ignore designated hitters and his former position of third base is surprisingly one of the most difficult positions to enshrine in the Hall. I do not like the DH, but Edgar's bat performed at Hall of Fame levels and that should be recognized. Pros: Compiled 2605 hits and 1330 walks over 23 seasons. Seven consecutive All-Star selections from 1981-87. During best 10-year stretch (1983-92) posted 49.3 rWAR. Led the league in steals from 1981-84, swiping 808 over a career (#5 all time). Cons: If cocaine is a PED--and it is--then you have to assume Rock Raines' speed was chemically enhanced. J-Doug says: Great peak. Great career stats. Electrifying speed. I'm pretty sure when voters inducted Andre Dawson they were confusing him with the other Expo. Sturgeon General: One of the most under-appreciated players of the last few decades. It is a shame that if he had 400 fewer walks and 400 more empty singles he would be a first ballot Hall of Famer. Pros: Six-time All Star. During his best 10-year stretch posted a superb rWAR of 51.9. Retired as one of the top offensive shortstops of all time. Cons: Hardly anyone remembers who he is (or was). J-Doug says: While Trammel's career numbers fall a bit short for me, his 51.9 rWAR during his best ten-year stretch (1981-1990) puts him over the top. That doesn't even count his 5 rWAR from 1980. Sturgeon General says: Has fallen victim to the inflated numbers of the "Steroids Era." Unfortunately the completion of his career coincided with the rise of Derek Jeter, Nomar Garciaparra, Alex Rodriguez and Miguel Tejada. Pros: Foreshadowed the dawn of the home run era by socking 49 dingers in his ROY season. Twelve All Star selections in 16 seasons. Led the league in homers four times, including his then-record 70 HR campaign in 1998. Led his league in slugging 4 times. Posted 47 rWAR duing his best 10 year stretch (1990-1999). Hit 583 home runs (#10 on the all-time list). Cons: Career fell off a cliff rather quickly, posting 0.4 rWAR in 2001 (his final season, only three years after his triumphant 1998). Nagging issues regarding PEDs. J-Doug says: I'm a small hall guy, and his 63.1 rWAR just doesn't cut it for me. His career just didn't last long enough, and his peak was far too short. I'll never forget #62 sneaking inside the left field foul poll that night, but that memory isn't enough to elevate Big Mac to HOF status. Sturgeon General says: Even when ignoring the steroids issue, Big Mac's candidacy has issues. He only has 7,660 career plate appearances. No player born since 1924 has made the Hall with that few plate appearances. The next closest person is Kirby Puckett, who had several hundred more PAs and only stopped at that due to career ending glaucoma. Pros: Five-time All Star. Seven Gold Gloves. MVP year was one of the best in the last couple decades. Strong career rWAR at 67.3. 46.9 rWAR duing his best 10-year stretch (1993-2002). Cons: Colorado's atmosphere almost certainly make his numbers look better than his true talent. Born in Canada (just kidding). Sturgeon General says: Was a last minute addition to my ballot. Only after reviewing his numbers and seeing his career rWAR falls right in line with all the players I selected did I add him. However, he was one of the most dynamic players of the '90s. Pros: Posted 478 saves (#3 all time). Seven time All Star. Finished 2nd in Cy Young voting in 1991. Cons: Despite playing 18 seasons, led the league in saves only four times. Saves aren't a very good statistic. Lifetime win probability added (WPA) of 23.97 and clutch-adjusted win probability added (WPA/LI) of 13.93 are not all that impressive for a reliever with so much service under his belt. Sturgeon General says: Retired the all time saves leader but was never really an elite closer. Was a pretty good closer who lasted a long time and just compiled. Was the '80s and '90s equivalent of Francisco Cordero. J-Doug says: Sturgeon General says it best. While I think voters should actually consider longevity on HOF ballots, Smith never produced enough wins to merit consideration here. He may or may not have been better than Sutter, but he doesn't belong in the Hall either. Pros: Pitched one of the most memorable postseason games in history. Cons: Was very good, not great, and certainly not elite, the rest of the time. J-Doug says: Simply was never one of the best. Sturgeon General says: Every year he gets a lot of hype, but when you look at the numbers they are surprisingly lacking. Only reason he gets any consideration is because of his epic Game 7 performance in the 1991 World Series. However, despite that legendary outing, he was not a particularly dominating postseason pitcher. Pros: Six-time All Star. Nine gold gloves. Twice led the league in hits, thrice led in doubles. Cons: Career was cut short by back injuries. Posted only 39.8 rWAR. J-Doug says: All apologies to my late stepfather who loved Donnie Baseball, but Mattingly just didn't cut it. Injuries hurt him too early in his career. He was one of my childhood favorites, but he's just not among the best. Sturgeon General says: The argument in his favor is that his career numbers are similar to Kirby Puckett. However that ignores the fact that Puckett played one of the most difficult defensive positions whereas Mattingly played one of the easiest. Pros: Was consistently among the best in the game during the 1990s, posting 48.1 rWAR (his best 10-year stretch). Four all-star selections vastly underestimate his contributions. Cons: First big name player to be suspended for testing positive. Probably lied to Congress. J-Doug says: I have a hard time separating Palmeiro from Walker and McGwire, neither of whom I voted for. His best ten years were marginally better than McGwire's, but Camden Yards may have helped his stats nearly as much as Coors helped Walker's. I'm going with my gut on this one. Sturgeon General: Cannot support a guy who in my opinion blatantly and intentionally lied to Congress about steroid use. Pros: Retired a 5-time All Star with 493 dingers. Probably one of the better fielding 1Bs early in his career. Cons: Paltry value stats, including a 38.5 rWAR during his best 10 year run from 1988-1997. Career 50.5 rWAR just doesn't cut it for Cooperstown. J-Doug says: There was a time when I thought that the steroid revelations would make McGriff look better relative to his peers. They have not. If there's any such thing as an "empty" slugger, McGriff was it. Sturgeon General: Have to be honest, I rooted against McGriff hitting 500 career homers. Nothing against the Crime Dog, but I felt at the time that he would be the first 500 home run hitter to fail to make the Hall. Was a very good player for a number of years, but never was elite nor did he have the longevity to make it to Cooperstown. Pros: Posted 45.2 rWAR during his best 10-year stretch from 1993-2002. Won a batting title in 1998. Cons: Posted 2.1 rWAR in his other six seasons. Played 2005 below replacement. Posted a staggeringly low -12 fielding wins over his career. J-Doug says: After his 30 homer year in 2000, I really thought Bernie was going to Cooperstown. I thought for sure he'd get to 3,000 hits. When he started winning gold gloves (which I now recognize were undeserved) I was even more confident. But then he started sliding fast. Then his career fell apart. With apologies to my ex-girlfriend Barbara, my best friend Dan and myself ten years ago, Bernabie Figueroa Williams does not belong in the Hall. Sturgeon General says: Another very good player but never a particularly stellar defender (despite the Gold Gloves). Accumulated his entire rWAR value from 1995 to 2002. The remaining seven seasons in his career were around replacement level. Cons: Value stats are underwhelming (31.8 rWAR during his best ten season run; 33.5 over his career). Once busted at an airport with large quantities of HGH. J-Doug says: Was there anyone who thought Juan-Gon wasn't a surefire HOF inductee after he won his second MVP in 1998 (with 50 2B and a 149 OPS+)? In hindsight, this player added few wins for someone with such a meteoric career. Sturgeon General says: One of the worst stars ever. Image was boosted by gaudy RBI numbers that mysteriously vanished once he left Texas. Did not deserve his MVPs. Sturgeon General says: As a Phillies fan I've always had a soft spot for Mulholland. Terry was often miscast as the ace of their staff during the early '90s and also threw a no-hitter with the club. Despite an elite pickoff move and good control, Mulholland is not even remotely close to making the Hall. If I'm reading your counterargument correctly and your biggest issue with Palmeiro is his dishonesty, would you vote for Ty Cobb? Surely attempted murder is worse than perjury. Other than that, solid ballot. Mine was the same as yours, plus McGwire, McGriff, and Smith. That is an interesting question Lewie, thanks for taking the time to pose it. This is the problem with the Moral Clause in the HOF debate. How does one apply it uniformly? Is it fair to apply it to Palmeiro for cheating and lying about it but not to Gaylord Perry for cheating and celebrating it? Those are fair questions. By applying moral judgement as a basis for my reasoning I am putting myself in murky waters and opening myself to criticism if I am not consistent. Considering morality is a very subjective topic no matter how I view it will be in poor taste to someone. Now for the question at hand. Would I vote for Ty Cobb? First I would just like to say I am not a fan of these types of questions. He has been in the Hall for over 80 years and people had a different understanding of baseball, life and acceptable behaviors in general during his lifetime. So I find it tough to retroactively go back and apply today’s knowledge and standards to a very different era. That said, I will answer your question. As you do not need to be told Cobb was by just about all accounts a lousy human being. I would call him a racist as well but I am not sure sure he discriminated on the basis of race, I think he may have just discriminated against anyone who was not him. However, I am not actually convinced he is a murderer. Here is what I know. Supposedly Cobb and his wife were mugged while in the car by 3 people. Cobb was stabbed yet managed to scare off 2 of the attackers while leaving the third one in pretty rough shape. But is that attempted murder? I say we don't know enough about it to make that determination. All we have are a few newspaper stories from that time which Cobb says all the assailants escaped. It is not until 40+ years later when his autobiography comes out that it is said he roughed up one of the attackers. It is not for decades still that the story turns into the roughed up guy was killed. So I don't buy into the Cobb was an attempted murderer story and I would not use that as reason to exclude him from my hypothetical 1939 ballot. For the record, I am opposed to attempted murderers entering the HOF. Next year we get to decide whether or not we admit convicted perjurers. Hooray! The larger point I was making, though, is that there are two arguments against PED users out of the Hall. One: That their numbers/performances were illegitimate because they were artificially aided. And two: That they were bad people for cheating and (in some cases) lying about it or breaking the rules. If you choose the former, you'd have to throw out Gaylord Perry and Whitey Ford (ball doctoring), Mickey Mantle and Willie Mays (amphetamines), and Pud Galvin (his horrible sheep testicle concoction), to name a few. Maybe even Cobb too, for his spiked cleats. What about Derek Jeter's pretending to get hit by a pitch a couple years ago? I'm not saying that was on the same level as throwing spitballs or using PEDs, but he definitely tried to gain an advantage he hadn't earned through illicit means—does that mean he's disqualified? If you choose the latter, I'd say you have to throw out not just Cobb (who also beat up a handicapped fan once) but Bob Gibson and John McGraw. Babe Ruth drove drunk. I'd bet at least a couple dozen inductees were huge racists (a function of the time, but still). I'm sure there are more than a few HOFers who cheated on their wives or were just genuine jerks. Where do you draw the line of character? Personally, my solution when filling out my (mock) ballot is to ignore the character clause altogether. If there were some concrete agreed-upon standards or a way to apply it consistently it might be useful, but I don't think it's fair to keep juicers out when quite a few other cheaters and undesirable characters are already in. By the way, thanks for the thoughtful response—well-reasoned debate is always refreshing. I read a great argument by Jayson Stark against excluding steroid users from the Hall. In it, he he didn't take the side of morality or cheating. Instead, he simply stated the obvious; the Hall of Fame is a history museum and as such, should showcase the "entire" history of the sport and not just gloss over a entire generation of ballplayers simply because of either proven or perceived transgressions. It was an interesting point, and it will certainly be put to the test in the coming years, especially in 2013. @Lewie Pollis: Wow, never heard that one before. Still not entirely convinced that was motivated by race only because I've read stories of him beating the Tigers' white bat boy senseless over similar offenses. I honestly think he was just a rotten person who used any reason possible to discriminate against everyone around him. Regardless of motivation though it is a despicable act. I knew about the handicapped fan, sharpened spikes and some other grievances that made him a generally lousy human being. But I don't like to go back and look at the current members of the Hall and apply today's standards on them. Cause when its all said and done there will be no one left. Ruth will be out because he used a doctored bat, Galvin for testosterone. Even though both things were legal then, today they would not be so it can be justified to toss them. Thats not to mention everyone who played during the 60s, 70s and 80s for amphetamines. Problem is if we start doing that for character then I am going to start doing that for performance. Tinker to Evers to Chance makes for a great line in a poem but I am not so sure they all belong in the Hall. Jim Rice may have been feared in his prime but he didn't last long enough to deserve entry. Mazerowski may have hit the first ever World Series ending walk-off HR but his numbers come up a little short the opinion of many. Thats why I don't like to play this game of retroactive judgement. When it comes to the members of the Hall of Fame I find it best to eschew our innate sense of presentism when looking at inducted members. Once people are in then they are in and I no longer want to sit around and debate their merits. However, I think it should also be noted that just because people may not have taken the character clause into heavy consideration in the past does not mean we should not today. The world changes and the game continues to develop. There are issues today that didn't exist 50 years ago. I'll be honest, my stance on Palmeiro is kind of a kick the can down the road approach. I am not quite sure what to make of the so called "steroid era" offenders. A few years ago it would have been clean cut, if you took steroids or other similar PEDs then I would not support you. Today, I am not so sure because due in large part of Stark's argument that Fragnoli cites above. At the end of the day the Cooperstown is a museum. It is there to document the history of the game. This is something many people tend to forget, myself included. I think I am slowly moving towards that mindset but I am not there yet. So as of now, I am just not comfortable selecting Palmeiro on my mock ballot. Maybe next year. Makes sense. I totally respect that.